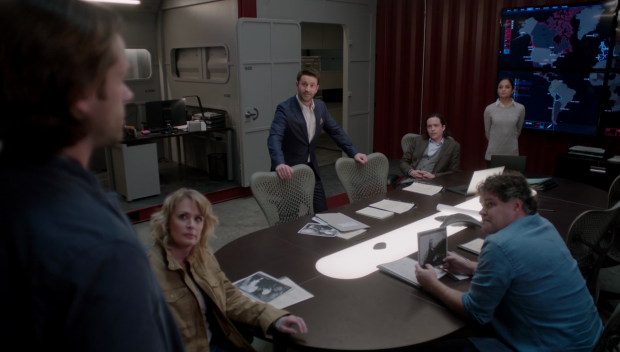 Supernatural focuses on the Men of Letters and explores Sam and Dean’s strained reaction to Mary’s affiliation with them. I mentioned last week that the Men of Letters plot was in need of development and this episode certainly brings that. It can be really interesting to separate Sam and Dean to enhance their perspectives on a given issue and show how they react differently. 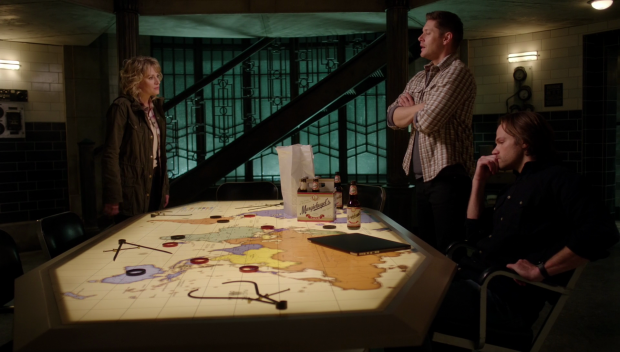 Sam has always been the more rational of the two where Dean is quicker to jump to conclusions so playing this up without having the other to balance it out can create some interesting scenarios. Sam and Dean’s different ways of approaching things are made clear in the opening minutes of the episode. Dean is clearly upset with Mary for allying herself with the British Men of Letters and has no problem letting her know that. It manages to bring out some buried feelings he has as well. One thing this show has always done well is make the larger than life problems relatable by linking them to feelings the viewer can understand. What we have here is essentially a man processing his abandonment issues by confronting the person he feels abandoned by. Mary was dead but in Dean’s mind she was gone and therefore has nothing to do with the man he has become so has limited ability to understand what he’s going through at this point. Her behaviour since her return has done nothing to improve that and he feels that joining with the Men of Letters is a personal betrayal. It’s a really good scene with a powerful performance from Jensen Ackles. He plays angry without going over the top and seems hurt more than anything which fits the situation perfectly. Samantha Smith also delivers an engaging performance as Mary who is clearly unable to deny anything that Dean is saying. The end of this scene where Dean tells her to leave perfectly sums up how hurt he is as well as his unwillingness to even consider her side. Mary has nothing to say which speaks volumes about her lack of confidence in her decision. Sam doesn’t say anything during this scene because he has nothing further to add to this and understands that Dean needs to vent his frustrations before he will be willing to listen to reason. This shows the bond between the brothers that has grown over the seasons while reinforcing how different Sam and Dean are as people. Sam doesn’t feel the same betrayal that Dean does but he doesn’t have the benefit of remembering his mother so doesn’t have that same connection or the same expectations. The calm and measured way he advises her that she should leave is because he knows that Dean can’t face her at the moment but has nothing to do with his feelings. Their discussion afterwards where Sam tries to get him to see the other side of the situation is interesting as well. Dean becomes frustrated with Sam because he tries to see both sides of the argument rather than picking sides. He needs support at this point not rationalisation so resents Sam for not taking his side even though he’s doing everything he can to solve the problem in his own way. This makes it a good time for them to go their separate ways for a while and do their own thing. Sam decides to go with Mary and see if the Men of Letters have any merit to them which suits his character really well. He calmly takes the whole thing in and learns about their methods which aren’t entirely without merit. Their base of operations looks really cool and the people inhabiting it having a more analytical role allows Supernatural to stray into the rarely explored thriller territory. We haven’t seen such a slick and coordinated Hunting operation before so it’s something that feels different and gives depth to the organisation. I found their approach to Vampires really interesting. 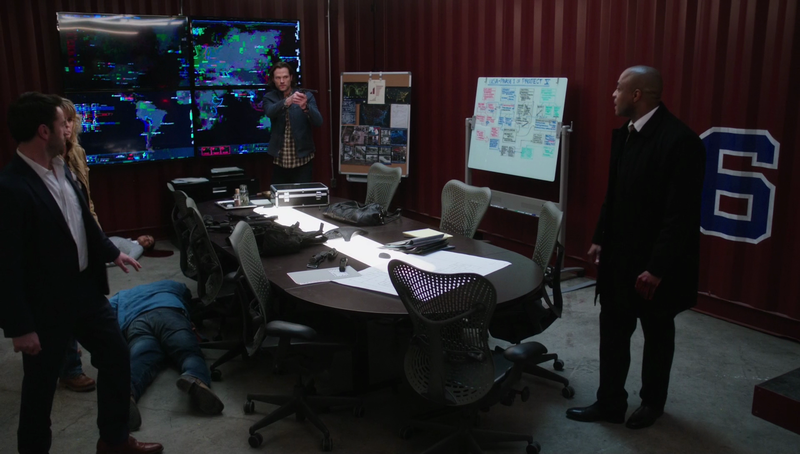 Sam, Dean and the other hunters have only ever dealt with them on a case by case basis without ever really considering that they might be organised on a much larger scale. The Men of Letters take a completely different approach and treat them as terrorists who operate in smaller cells spread across the country that coordinate with one another in different ways. This is a completely different approach to what we’ve seen before and Sam does see the merit in it as he has never considered that before. Their goal of destroying every Vampire in America is a lofty one but seems achievable based on the work they have already done. Of course it’s not a good idea to introduce an organisation that put Sam and Dean to shame in terms of their methods so flaws in the approach are seen. In their own way they’re very careless and don’t consider that someone they recruit might betray them to the Vampires. The other Hunter Pierce (Aaron Douglas) is a big presence in the episode in terms of the number of scenes he’s in but barely makes an impression which removes suspicion from him. It’s not common to see Hunters working with the things they hunt so the possibility of betrayal didn’t even cross my mind. It didn’t feel like a big shock when it happened either but it was effective enough at showing a gap in the assumptions of the Men of Letters. Their inability to deal with an attack on their base is another weakness that puts Sam and Dean ahead of them. None of the people working there are able to fight so they are completely incapable of defending themselves which means it is down to Mary and Sam to handle the situation. There seems to be a model for each side learning from the other as their information gathering approach could be easily combined with the practical Hunting skills to create an effective partnership. That’s what Mary is trying to do and I get the impression Sam is coming around to the idea as well based on the demonstration he sees in this episode. The return of the Vampire Alpha (Rick Worthy) was welcomed. He is such a charismatic and interesting villain who comes across as very threatening. His stand-off with Sam was really well done as it had both of them at an impassible stalemate. Both sides are bluffing as Sam threatens him with the unloaded Colt and the Alpha claims that the Colt can’t kill him anyway so neither side is willing to call the bluff that keeps them both alive. The misdirect when Mick pretends to attack Sam as a cover for supplying him with a bullet is really clever especially when the Alpha thinks back on it and realises what happened. It’s a shame that the Alpha is killed in this episode but there are no complaints from me about how his death was handled. Their discussion about the balance between Hunters and Vampires was really interesting as well. The Alpha didn’t get heavily involved before this point because the Hunters weren’t a significant enough threat as his “children” did as much damage to them as their numbers so he was comfortable with the balance. This changed when the Men of Letters escalated the conflict to aim for extinction and I wonder if this will extend to other supernatural beings who might become more aggressive because the balance that once existed is being disrupted. I really liked that this episode focused on Sam and Mary because it’s a relationship that needed to be further developed. This episode doesn’t add many layers to it but having them work together is something we haven’t really seen up to this point but defining their relationship is necessary as they don’t have the same history that she has with Dean. It seems that they make a good team so this is a solid foundation to build on. Dean finds a way to process his feelings a different way when Mr. Ketch shows up to extend an olive branch in the form of a really expensive bottle of Scotch. This pairing has less focus than Sam and Mary but less screen time is needed to get the point across. 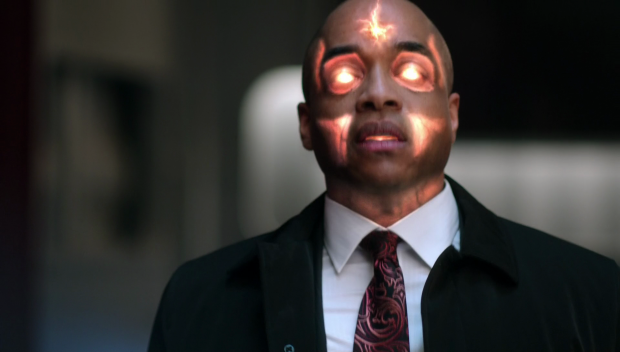 The episode makes the point that Mr. Ketch and Dean are more similar than Dean would care to admit. Everything is said in the knowing look he gives Mr. Ketch when he calls Dean a killer who needs to embrace that side of him before too long. In many ways Mr. Ketch understands him and that’s a big part of why they make such a compelling team. There are some really good character moments in their pairing such as Mr. Ketch putting away his gun in favour of a blade because it seems like it will be more fun. The similarities between them are staggering and so much fun to play with. Even though they have a lot of similarities there are a lot of important differences as well. The main thing that separates them is that Dean knows where to draw the line and is capable of showing compassion. This is something that Mr. Ketch is clearly unable to do and is evidence by his treatment of the Vampire they encounter. He brutalises her where Dean simply interrogates her and promises to show mercy by making her death quick. This is about as far as he can go as she is far too dangerous to be let go but Dean shows her the only compassion he can and that’s something Mr. Ketch would never do. Dean’s adventure with Mr. Ketch gives him the space he needs to contextualise his feelings about the situation and make some kind of peace with it. He recognises that he and Mary are both adults and she is free to make her own choices even if he doesn’t approve of them. Dean never promises to agree with what she’s doing but he does resolve to try to get used to it which counts as some kind of acceptance. I do think that the Men of Letters plot has a lot more coming and I wouldn’t be surprised if Sam and Dean find a way to work with them in the coming episodes. It’s building slowly which is working so far as we are getting just enough progression to keep it interesting. The main question of the moment is who runs them as there are a few vague references to a boss that suggests some kind of dramatic reveal might be coming. I’d quite like it if there was some kind of supernatural being in charge who wanted to thin the herd for their own kind to take over but we shall see. A really good episode that develops the Men of Letters plot in interesting ways. Splitting Sam and Dean up to experience it for themselves is a good idea and it ties into their disapproval of Mary’s choice to work with them. Sam takes this better and chooses to learn more before making his own judgement but Dean feels hurt and betrayed by Mary who he feels abandoned by. It’s a dynamic that suits the characters and it allows Sam to work with Mary to develop their relationship. 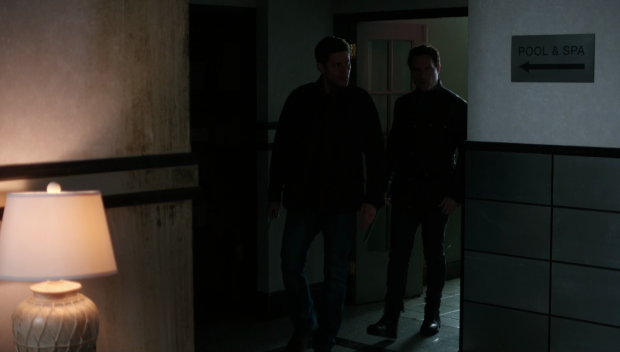 Dean working with Mr. Ketch is good for highlighting their similarities as well as their differences and allowing Dean to work through his feelings about the situation. I really liked learning bout the Men of Letters in terms of their structure as well as their tactics. Their base was really cool and their approach is something we haven’t seen before. The episode also does a good job of not making them have all the answers as shown but how unprepared they are for an attack. Having the Alpha Vampire back as a villain was a nice touch but it’s a shame he was killed. He was memorable while on screen though. There is still work to do on the Men of Letters and the vague references to their boss suggests that a reveal is coming in the future.